The beauty industry is heavily saturated with beauty boxes. Whether you're a makeup, product, or nail junkie, there's a box for everyone. 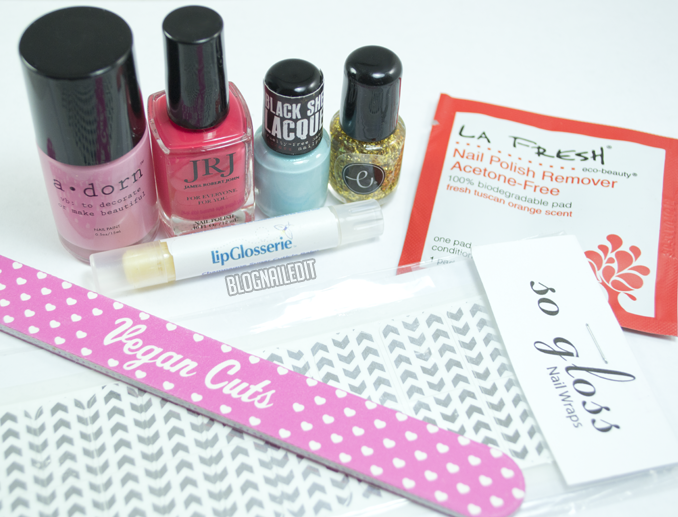 A new box caters to an even more specific crowd - introducing the Vegan Cuts Nail Box. The products in the Vegan Cuts Nail Box are all vegan - meaning they do not contain any animal products (which may include silk from silk worms, guanine from fish scales, or carmine from scale insects). While I personally don't get squeamish from these products, I understand that others do, and for those people, Vegan Cuts may be just the right subscription. 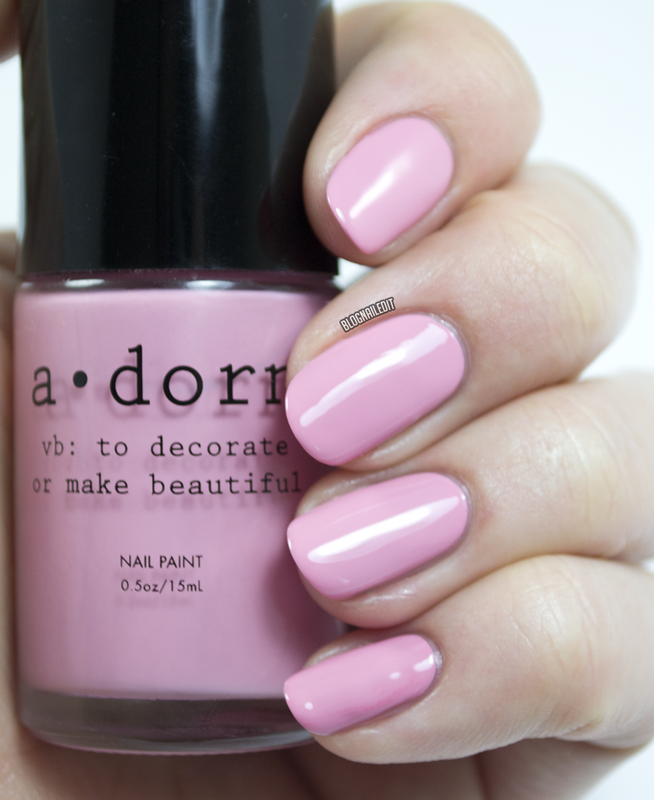 Adorn Nails in L'Age d'Or or Vive Le Coquette - .5 oz. James Robert John in Just This Once - .4 oz. LipGlosserie Cuticle Balm - .25 oz. Black Sheep Lacquer in Cloudy Skies - .2 oz. Elysian Nail Lacquer in a summer shade - .2 oz. As you can see, the box is a mix of sizes, brands, and effects. Here's a look at some of the products in the box on their own. Just This Once (2 coats) is a full size bottle. It's a salmon coral creme, applying well in two coats. Vive Le Coquette (1-2 coats) was a pleasant surprise. It applied really easily and had almost complete coverage in 1 coat. The color is a warm, dusty muted pink. The formula was my favorite in the box. Cloudy Skies (3 coats) is a teeny tiny sample bottle, which always disappoints me in a beauty box. Plus, with this formula requiring 3 coats, the bottle won't last very long. That being said, it's a beautiful color - a robin's egg blue with iridescent shimmer. There are two more products in the box that are specifically for decorating your nails with. I've incorporated both of them into my final look. The gold shard polish is from Elysian Nail Lacquer, and after a little digging, it appears to be Misapplied Magic. Another teeny tiny sample size bottle, you won't get much out of it, but it's a fun topper to add to your collection. Growing up in Southern California, the gold rush was something we studied, so this reminds me of gold flakes we'd pan for on various field trips. Shards of gold fleck...very pretty. The other colors in my final look are Cloudy Skies and Just This Once. 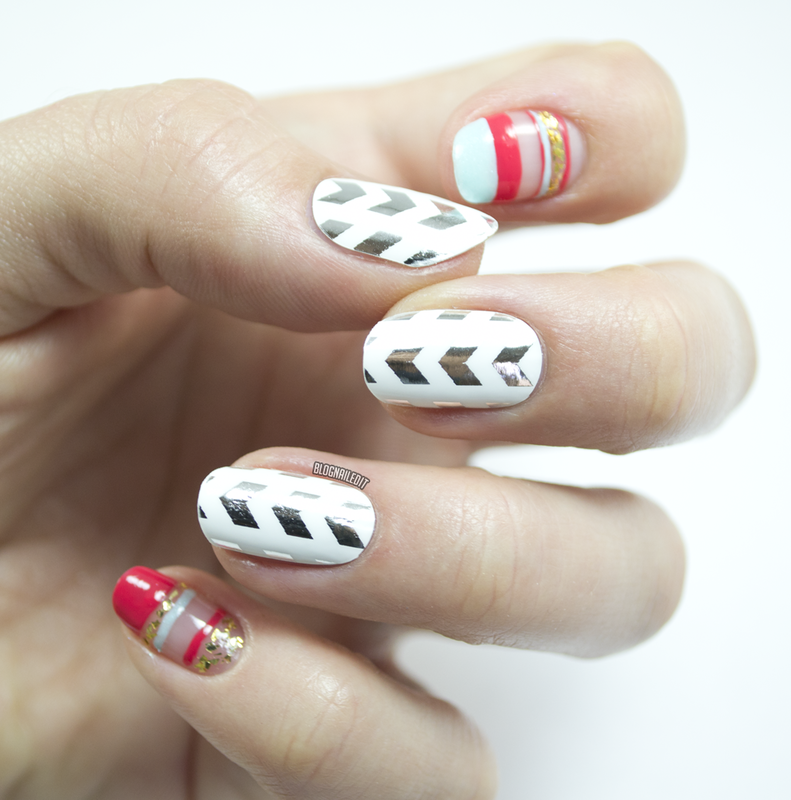 I just freehanded the look with some negative space for visual interest. There are also three products that aren't polish or nail wraps. The LipGlosserie cuticle balm is deceiving. I applied it to my lips (maybe more than once) because it comes in a little chapstick tube. Didn't seem to cause any problems though! It's actually meant for your cuticles, and it works well there too. Not very long-lasting, but a nice emergency touch-up to have in your purse if your cuticles are feeling nasty. The La Fresh Acetone-Free Nail Polish Remover wipe was a nice addition to the box as well. The wipe smells fresher than your typical polish remover, and does a pretty decent job of removing polish. I didn't have a top coat on my nails, but the polish all dried, and one wipe got it off of the nails on one hand. 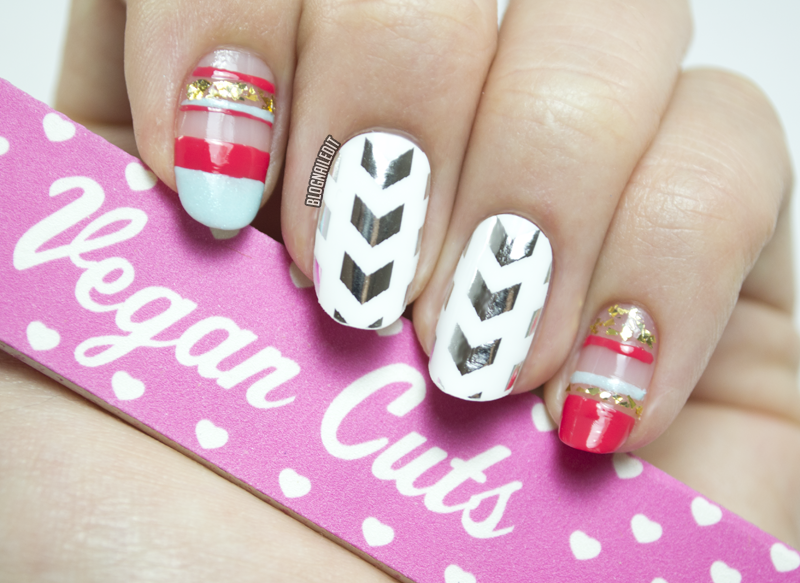 There's also a Vegan Cuts nail file, which seems to be a fairly high grit (meaning it's softer on your nails). It's a nice thing to toss in your purse. To subscribe for the box, visit the Vegan Cuts website. To me it seems overpriced for the products that come, especially since some aren't full size polishes. But you may think differently, and I encourage you to make your own decisions based on what you see.